If you keep your peanut butter in the refrigerator take it out and let it get to room temperature, so it is soft. Place one banana half on a piece of parchment paper on a flat surface. Place another piece of parchment paper over the top of the banana. Use something flat, like a large frying pan, to press down on the banana. Press firmly and evenly. Don’t make the banana too thin. You want it to be at least a 1/4 inch thick so you can still handle it. Move banana to a plate and repeat with the other half. If the banana is really soft, put it in the freezer for thirty minutes or so before adding the peanut butter. The easiest way to get it on the plate is to flip over the parchment paper onto the plate and then carefully peel off. Sprinkle banana with cinnamon (do this before freezing). 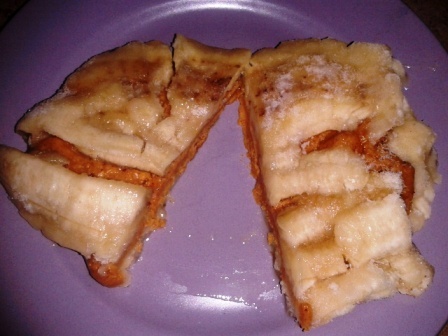 Carefully spread peanut butter on one half of banana, then top with the other half. 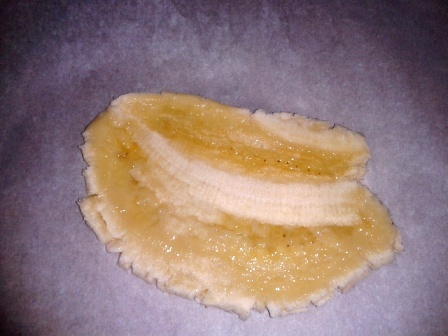 Freeze banana for 2 – 3 hours. I bet this is awesome – I love peanut butter and bananas together..yum!